SPINNING TOP Both Bennu (left) and Ryugu (right) have a diamond shape that is common for asteroids of their size, but scientists can't yet explain how the shape forms. WASHINGTON - New up-close images of Bennu have confirmed that the asteroid is shaped like a spinning top. That look, characterized by a raised equatorial ridge, is shared by other similarly sized asteroids in the solar system including Ryugu, currently being explored by Japan's Hayabusa2 spacecraft . NASA's OSIRIS-REx spacecraft arrived at Bennu on December 3. But new observations show that both asteroids are spinning on their axes too slowly to explain their shape, says Hayabusa2's mission manager Makoto Yoshikawa of the Japanese space agency JAXA. If the rotation is fast enough, momentum can push loose rocks toward the equator, giving an asteroid a spinning-top shape. But Ryugu rotates once on its axis only every 7.6 hours; new data show that Bennu rotates once every 4.3 hours. With spacecraft now exploring both Bennu and Ryugu, researchers hope to figure out the asteroids' puzzling appearance. "It's an asteroid geologist's dream to have a mystery like this to solve, OSIRIS-REx principal investigator Dante Lauretta of the University of Arizona in Tucson said December 10 in a news conference at the American Geophysical Union meeting. The asteroids' spin rates could have once been faster but slowed over time due to a phenomenon called the YORP effect. It occurs when particles of light in the sun's rays hit different types of surface materials on an asteroid. That light bounces off some materials, adding a little bit of momentum that can accumulate over time and act as a counter to an asteroid's spin. Other materials absorb that light and then radiate it back out as heat, exerting a force that can also change an asteroid's spin, and therefore its shape. As OSIRIS-REx continues to monitor Bennu, it will compare the observed rotation rate of the nearly 500-meter-wide world with ground-based observations in hopes of tracking how its spin may shift over time. Those observations could reveal if Bennu's spin was ever fast enough to give it its diamond shape. Yet another remote possibility, says Patrick Michel, an astrophysicist at the Observatoire de la Cote d'Azur in Nice, France, is that the shapes were created during the asteroids' formation, skipping the YORP effect entirely. Both Bennu and Ryugu are rubble piles built from the leftovers of collisions between asteroids in the solar system. When their parent bodies split apart, bits and pieces may have migrated back together to form the current asteroids' look, he says. 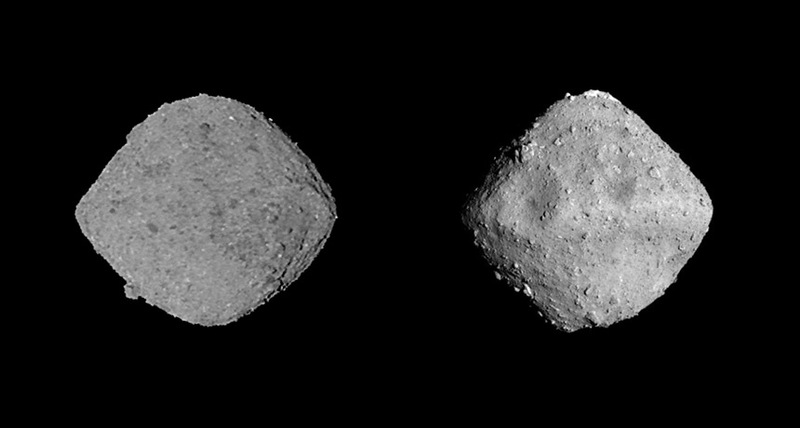 Still, Bennu and Ryugu aren't identical twins. At its equator, Bennu is much more square shaped, new data reveal, whereas Ryugu is circular. And though both asteroids boast an equatorial ridge sprinkled with craters and boulders, Ryugu's is much more pronounced, Yoshikawa says. Astronomy writer Lisa Grossman contributed to this story.